Visitation will be from 9:30 a.m. to 11 a.m. on Friday, August 10, 2018 at St. Anthony Church, Mass will begin at 11 a.m., and burial will follow at 12:30 p.m. at Maui Memorial Park, Garden of Meditation. Candy was a Floral Designer at Kahului Florist for 52 years until she retired. She is survived by her daughter, Michelle Santos; son, John (Capri) Santos Jr.; siblings, Dolores (Jay-deceased) Conroy, Patricia (Jimmy) Saltiban, Fred de Aquino, Leonard (Carla) de Aquino, Estrellita (David) Marcellus; and three grandchildren, Cade Betancourt, Celise Santos, and Jena Santos. Candy was predeceased by her husband, John Santos Sr.; daughter, Eileen Santos; parents, Pedro and Emelia de Aquino; sister, Louisa Pacubas, and brother, Andrew de Aquino. The family would like to acknowledge Hospice Maui for their compassionate care of Candy. Isabelle Leina‘ala Chartrand Kainoa, of Waiehu, Maui passed away peacefully in her sleep on July 22, 2018. Isabelle was born in Honolulu, HI on October 28, 1934, to John Frances and Edith Kalawai’a Chartrand. She retired from the State of California Department of Rehabilitation after 18 years. She was predeceased by her husband Royal Joseph Kainoa, Sr. She is survived by her children, Joyce Kuuipo Mandracken, Roy Ernest Kalaeloa Robins, Royal Joseph Kainoa, Jr., John Alan Kainoa, and David Kaipo Kainoa; grandchildren, Garrick, Damian, Joselyn, Joseph, Jessica, Kalaeloa, Ashley, Brandon, Kiana, & Kalei; great grandchildren, Braden, Neveigh, Jocelyn, Micah, Taylor, Terri, Jared, Braelyn, Keonilei, Tausili, Tasi, Onyx, Gracy, Emily and Kalaeloa; sister, Edith Kahoalii, and predeceased by brother Harold Chartrand. Also extended Chartrand Ohana.Visitation will be held at Norman’s Mortuary on Friday August 3, 2018 from 9:00 a.m. to 11:00 a.m. with service to begin at 11:00 a.m. Burial service will follow at Maui Veteran Cemetery at 1 p.m. Isabelle’s ‘Ohana would like to extend a special heart felt gratitude to the staff of Hospice Maui and Hale Makua Neighborhood C for their compassionate care of their mom during this time. In 1977, Suzie came to Maui to die. She had been diagnosed with Terminal Cancer of the Kidneys so she opened an Atlas, closed her eyes and pointed. Fate led her to Maui.The whole story is on the website of The Boo Boo Zoo, but alternative medicine and her love of nurturing animals gave her over 40 years of unexpected life. With her husband, Sylvan, they dedicated those years to establishing the life-saving work of the East Maui Animal Refuge. Suzie is survived by her loving & devoted husband, Sylvan J. Schwab; parents, Al & Jo Hawck; brother, Robert Hawck; and her children=hundreds of animals.Visitation will be held from 12 p.m. to 1 p.m. on Tuesday, July 31, 2018 at Ballard Family Mortuary in Kahului with service to begin at 1 p.m. and burial to follow at 2 p.m. at Valley Isle Memorial Park. In lieu of flowers, the family requests donations made in her memory to the East Maui Animal Refuge: 25 Maluaina Place, Haiku, HI 96708 Phone: 808-572-8308 www.eastmauianimalrefuge.org. Services to be held Wednesday August 1, 2018 12p – 4pm at Ballard Family Mortuary Hilo. 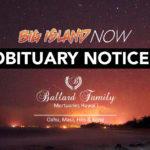 Online condolences may be sent to: www.ballardfamilymortuaries.com. 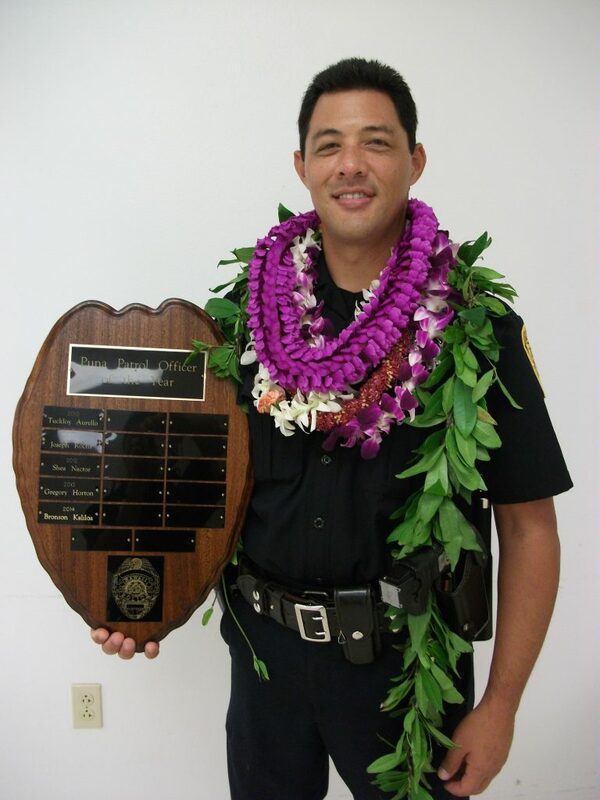 Bronson Kaimana Weimun Kaliloa, 46, of Keaau, killed in the line of duty on July 18, 2018, at Hilo Medical Center. Born January 26, 1972 in Colorado, he was a 10 year Police Officer for the Hawaii County Police Department.